Thanks to Dr. Raul Gonzalez, University of Rochester Medical Center, New York (USA), for contributing this case. To contribute a Case of the Week, follow the guidelines on our Case of the Week page. Try Amazon Prime now so you can take advantage of Prime Day, a one-day shopping event on July 15, 2015 with more deals than Black Friday. Prime members can shop exclusive deals from electronics, toys, video games, movies, clothing, patio, lawn and garden, sports and outdoor items and more! Remember, you can support PathologyOutlines by entering through any Amazon banner or link on our website - with no extra cost to you! Visit our Amazon Home page for more details. (1) We sometimes get asked why jobs remain posted on our Jobs page if a pathologist is told that it's filled. Read more to find out why. (2) Did you know that PathologyOutlines.com has information on new product and services, webinars and CME available for you to quickly and easily access? In the past month, we've posted a few New Product announcements and we have a large number of CME being offered by ASCP, ARUP and other organizations, and sorted by date posted and subspecialty. There are also upcoming webinars from ASCP and Leica Biosystems listed on our Webinars page, sorted by date, date posted and subspecialty. You can click on the links here or access the pages from our Home page. (3) To promote shopping at Amazon.com, particularly by going through our website, we have awarded Amazon gift cards of $100, $50 and $25 through a drawing of those who made purchases at Amazon.com in May or June 2015. Click here to see our winners! (4) Our Feature page for July is Digital / Imaging / Photography, and highlights our advertisers Milestone Medical and Photodyne Technologies. It also contains an original short article, "Forensic Photography: Getting the Best Shot", by Jaleh Mansouri, M.D. (5) We are again accepting interesting, non-duplicative cases for Case of the Week. For details on how to contribute a case, visit our main Case of the Week page. (6) Visit our Blog to see recent updates to the website. 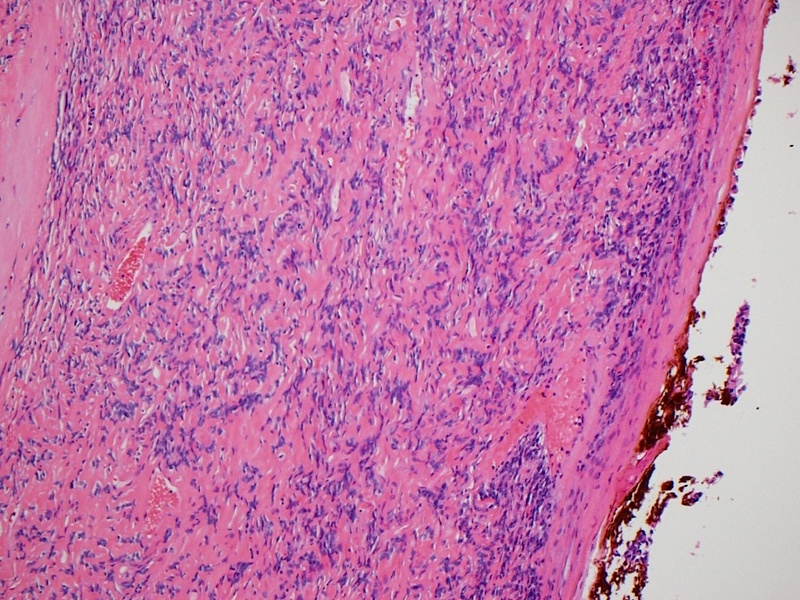 A 85 year old woman presented with a 5.6 cm left pleural mass. 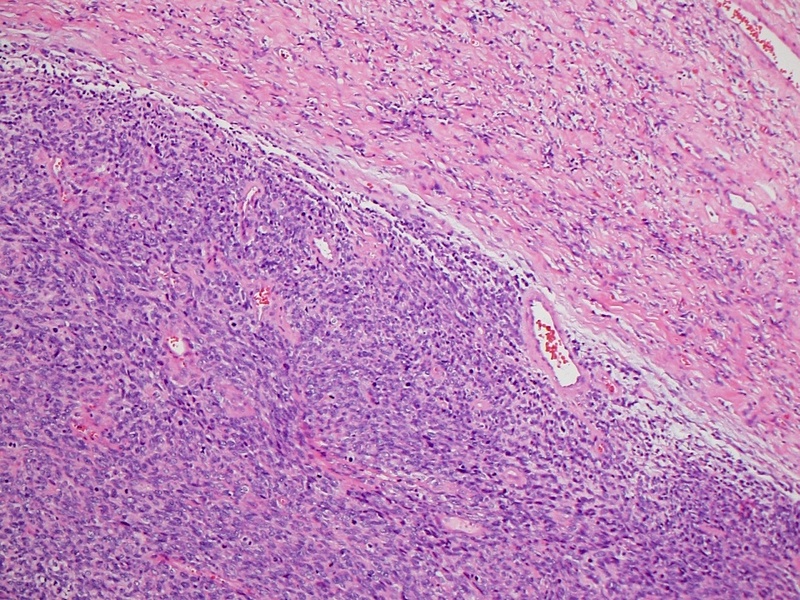 The lesion later metastasized to the patient's right lung. 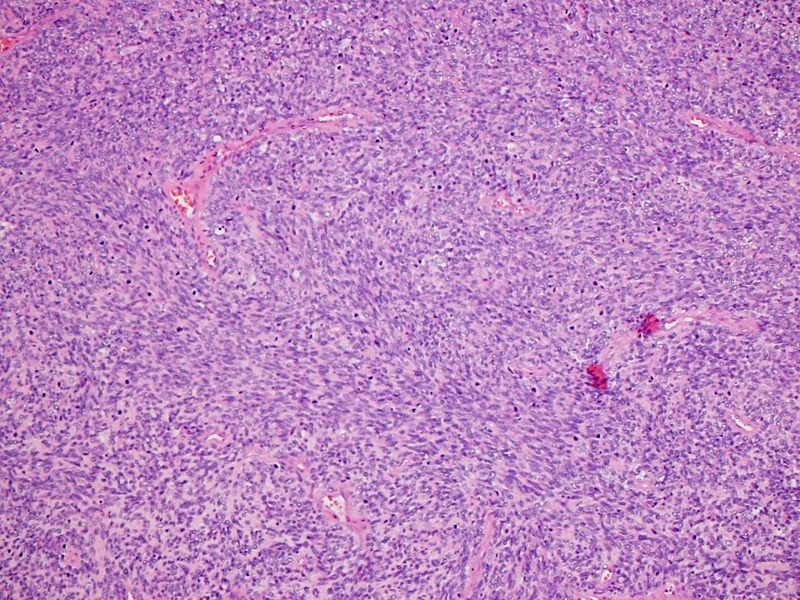 Solitary fibrous tumor is a fibroblastic proliferation, arising from the mesenchymal cells of the pleura, and usually due to recurrent NAB2-STAT6 gene fusions (Nat Genet 2013;45:180, Nat Genet 2013;45:131, Genes Chromosomes Cancer 2013;52:873, Diagn Pathol 2014;9:224). It typically is confined to the surface of the lung, arising from the visceral pleura (Surg Today 2015 Apr 19 [Epub ahead of print]). Clinically, it is associated with pulmonary osteoarthropathy, digital clubbing and hypoglycemia, which regress after tumor resection. 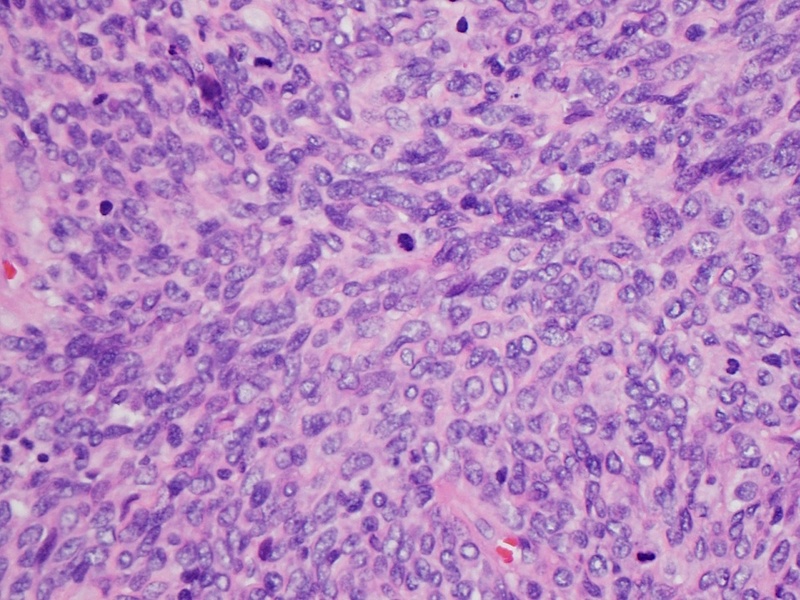 The hypoglycemia appears to be mediated by IGF-2 production (Doegge-Potter Syndrome), causing these tumors to also be designated IGF2omas (J Clin Endocrinol Metab 2015;100:2519, Pneumologie 2013;67:340). Grossly, it arises from the pleural surface by a pedicle, and appears as a solitary, well circumscribed and possibly encapsulated lesion. 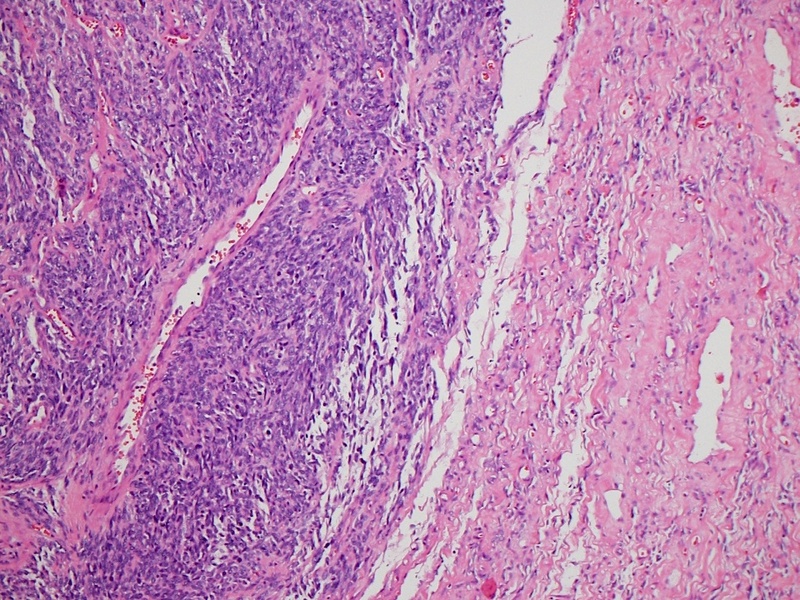 It is composed of dense, gray-white fibrous tissue with a firm, whorled cut surface, resembling uterine leiomyoma. 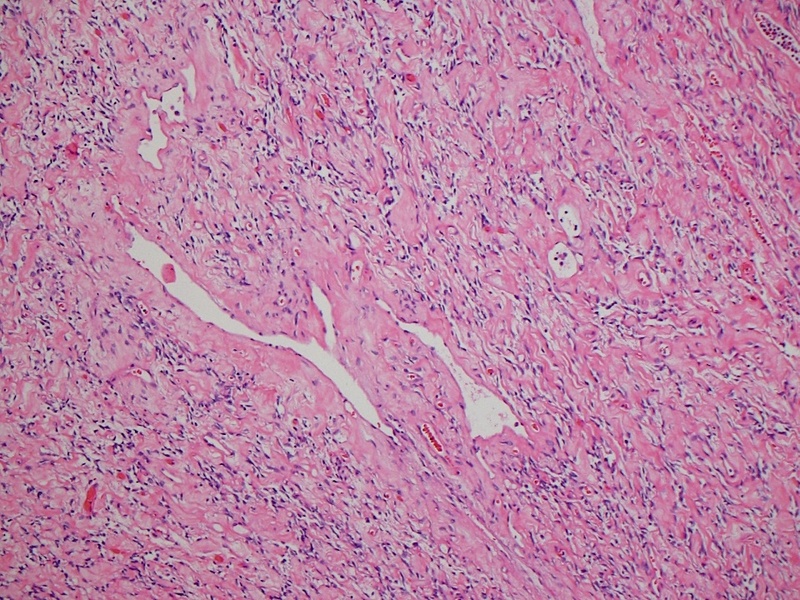 Large tumors may be cystic and hemorrhagic. 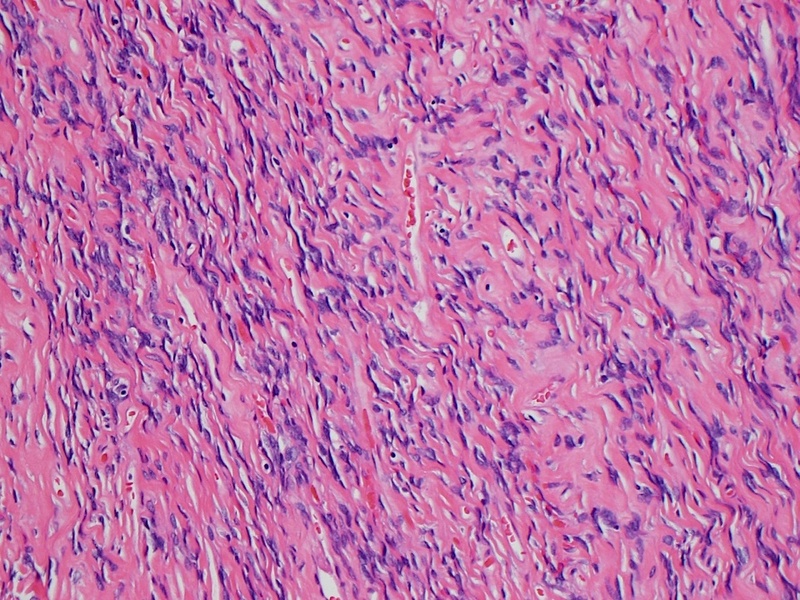 Microscopically, it contains fibroblast-like cells with variable cellularity in collagenous and keloid-like stroma, reticulin fibers and hemangiopericytoma-like vessels. 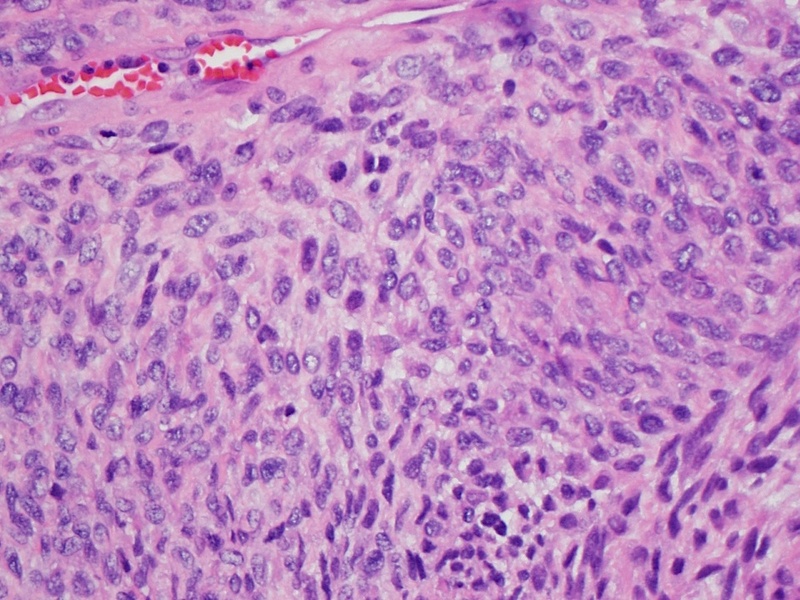 Typically, there is no/rare mitotic activity and no atypia. Tumor cells are immunoreactive for CD34 (strong), CD99 and vimentin, and negative for cytokeratin, EMA, S100, smooth muscle actin and desmin. Dedifferentiation has been described, with an abrupt transition between low grade and high grade areas, and loss of CD34 positivity (Am J Surg Pathol 2009;33:1314). 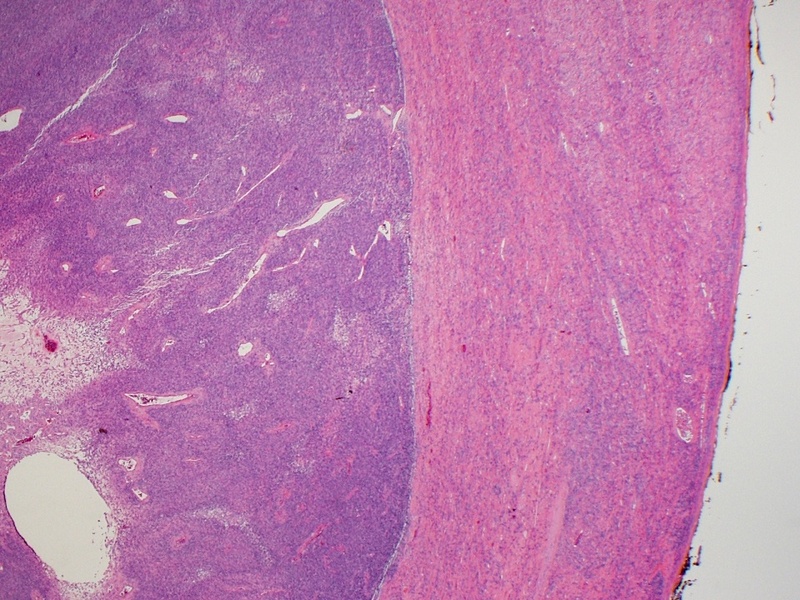 Features of overt malignancy include increased cellularity, marked nuclear atypia, prominent necrosis and high mitotic activity (J Cardiothorac Surg 2014;9:113). 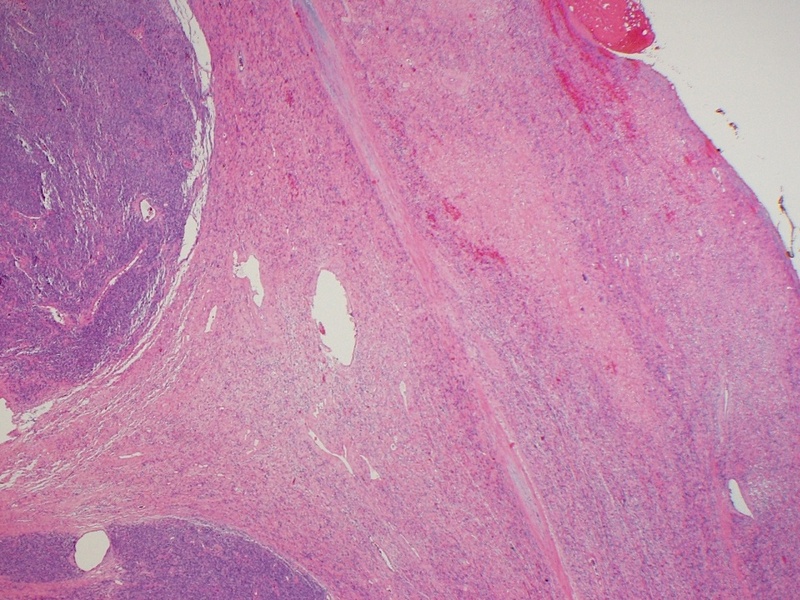 Benign appearing solitary fibrous tumors may recur locally, necessitating long term follow up, and rarely cause death due to extensive intrathoracic growth (Ann Thorac Cardiovasc Surg 2014;20 Suppl:441, Asian Cardiovasc Thorac Ann 2014;22:981). 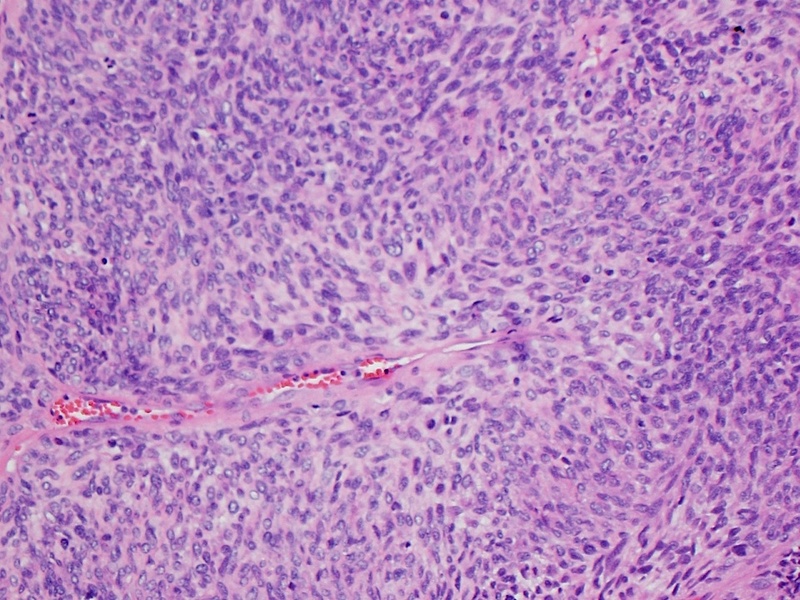 Malignant appearing tumors are associated with an aggressive clinical course and death in most cases (Am J Surg Pathol 2012;36:1202, Intern Med 2014;53:617).